Qualcomm Inc. (QCOM)’s growth prospects in the world’s largest mobile-phone market may be under threat after China’s National Development and Reform Commission began an investigation related to an anti-monopoly law. Qualcomm disclosed the probe yesterday, saying the NDRC advised that specific details are confidential. The San Diego-based company said it knows of no charge by the agency that it violated the law. Qualcomm gets revenue from sales of smartphone chips and collects license fees from wireless providers for the shipment of most Internet-capable handsets. The Chinese government has been stepping up corporate scrutiny as new leadership expands an anti-corruption drive and cracks down on business practices that lead to increases in consumer prices. China may also be trying to help local competitors such as Spreadtrum Communications Inc. (SPRD) by slowing Qualcomm’s push to broaden the reach of its chips and technology in the country, said Cody Acree, an analyst at Williams Financial Group in Dallas. Emily Kilpatrick, a spokeswoman at Qualcomm, said the company won’t comment beyond its initial statement. The office of Li Pumin, a spokesman for the NDRC, said it had no information immediately available on Qualcomm’s statement when reached by phone today. 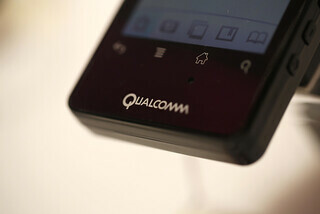 Shares of Qualcomm fell less than 1 percent to $72.49 at yesterday’s close in New York. The stock has gained 17 percent this year. Qualcomm’s customers in China include Lenovo Group Ltd., Huawei Technologies Co. and ZTE Corp., according to data compiled by Bloomberg. Since no specific accusations have been made, few handset manufacturers committed to Qualcomm will switch immediately as it takes 12-18 months to bring a new design to market, said David Wolf, managing director of Allison+Partners’ China practice counseling American, Chinese and European clients. Qualcomm, the world’s largest maker of chips for smartphones, got 49 percent of its $24.9 billion in sales from China in the fiscal year that ended in September, with some of that coming from devices assembled in China and sold elsewhere. The company yesterday said it will cooperate with the NDRC probe. Qualcomm was invited to a meeting about antitrust regulations in July by the country’s commerce ministry, a spokeswoman said then. The company gets the majority of its total revenue from chips, while the bulk of its profit comes from licensing technology that is central to modern mobile-phone networks and handsets. That means even phone-service providers that don’t use Qualcomm chips pay royalties to use its patents. The company collected technology-license fees on more than 1 billion phones in fiscal 2013 and sold more than 700 million chips. Spreadtrum, based in Pudong, China, earlier this year agreed to be acquired by Tsinghua Unigroup Ltd., a Chinese state-owned company, for $1.78 billion. China Mobile Ltd. (941), the world’s largest wireless carrier, hasn’t paid Qualcomm licensing fees after opting to use an alternative technology for its current data network that the Chinese government said wasn’t covered by the U.S. company’s patents. Qualcomm said it expected that to change next year as China shifts to a higher-speed technology for mobile networks called long-term evolution, or LTE. Underscoring the importance of the market, company executives said at an analyst day in New York last week that the network shift means Qualcomm will be able to supply chips and get licensing fees from China Mobile. Now, the NDRC probe raises doubts about that potential licensing revenue, said Gus Richard, an analyst at Piper Jaffray & Co.
“I don’t think China’s going to pay them,” said Richard, who rates the shares the equivalent of a hold. Chief Operating Officer Steve Mollenkopf said at the meeting last week that Chinese phone makers will use more Qualcomm chips in domestic handsets and then in export products as they aim to expand overseas. The company’s chips run on multiple networks, which let devices operate in different regions. “They all want to figure out a way not only to be leaders in China, but also be leaders worldwide,” he said. At the meeting, Qualcomm Chief Executive Officer Paul Jacobs was asked whether his business in China had been hurt by concerns about the U.S. National Security Agency spying on mobile-phone conversations. While such reports increased the focus on security of cross-border data traffic, they haven’t hurt sales of hardware, Jacobs said. He also said the Chinese government wants to create a bigger domestic chip industry. “There is pressure just generally in China on multinationals,” Jacobs said. The Qualcomm inquiry may be part of a broader investigation by the Chinese government agency aimed at keeping consumer prices from rising too quickly, and may not be a challenge to Qualcomm directly, said Mark McKechnie, an analyst at New York-based Evercore Partners LLC. He recommends buying the shares. In the market for the most advanced Internet-capable phones, Qualcomm has a share of about 60 percent and profit margins of less than 20 percent, McKechnie said. That indicates it’s facing tough competition and makes it more difficult to show evidence of a monopoly, he said. The Qualcomm probe is the latest example of the challenges that foreign companies have faced as they try to expand in the world’s most populous country. China’s state-controlled media last month accused Starbucks Corp. (SBUX) of charging too much for coffee and said Samsung Electronics Co.’s smartphones don’t work properly. International Business Machines Corp.’s China revenue slipped 22 percent in the third quarter as state-owned companies started delaying orders, including mainframes and servers. In August, the Chinese government fined six dairy companies including Danone for fixing the prices of infant formula products. The fine, a combined 669 million yuan ($110 million) for dairy companies including Mead Johnson Nutrition Co. (MJN), was a record for violating anti-monopoly laws. Another high-profile probe into a foreign company this year centered on London-based GlaxoSmithKline Plc. Four senior executives from the company were detained in July on suspicion of economic crimes.